The farmers in ancient India and Sri Lanka performed religious ceremonies connected with agriculture, their main livelihood. These ceremonies were in the form of poojas or offerings made to deities and also to the souls of their departed relatives, By these ceremonies people sought blessings and protection for their crops, cattle, their future well being, and in addition happiness and prosperity in all their endeavours. With the introduction of Buddhism, these religious practices continued in Sri Lanka, in the form of offerings made in the name of the Buddha, Dhamma and Sangha. The practice of making offerings to the Sri Maha Bodhi in Anuradhapura was made from the freshly harvested paddy crop and the ceremony came to be known as Aluth Sahal Mangalya. This year this religious ceremony was held at the Sri Maha Bodhi and was followed by a Pirith ceremony invoking blessings on the people and country. A portion of the paddy harvested during Maha cultivation was set aside by the farmers at the Kamatha (threshing floor). The paddy was then pounded by men and rice obtained was taken for the offering at the Sri Maha Bodhi. The paddy was from fields lying in the east direction. 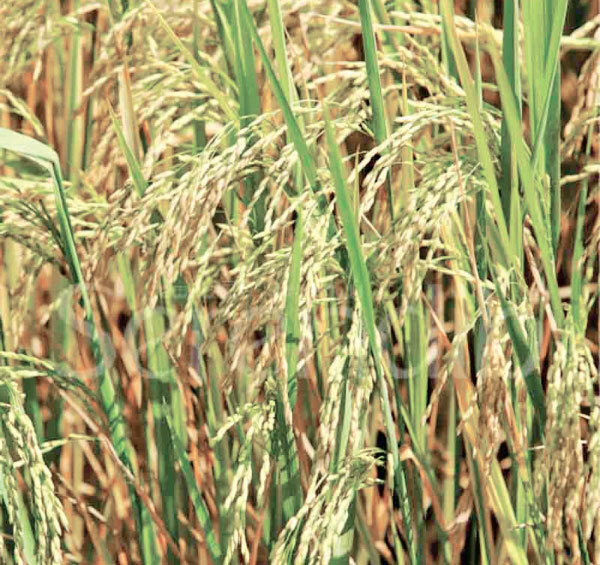 The paddy thus obtained is called by different names such as Agahas, Agasas, Akbatha, Mulyala, and Akyala. Farmers always retained the freshness and purity of the paddy selected for Aluth Sahal Mangalya. Farmers in Sath Korale followed a different method of performing the ceremony. They erected a hut on the threshing floor where the paddy was pounded by men and thereafter took their portion of paddy to the irrespective homes. The Mahavamsa mentions how King Mahatissa went in disguise and reaped the harvest from a field and received his share of paddy as payment for his labour. Out of the share of rice he thus obtained he made the offering and participated in the ceremony Another text Sanyanjatha Malaya mentions how King Devanampiyatissa went in disguise and worked in a field and obtained his share of rice which he then made as an offering to a Bhikkhu in the manner of Aluth Sahal Mangalya. At the Sri Dalada Maligawa, the annual Aluth Sahal Mangalya is held a few days before the Duruthu Pasalosvake Poya which is followed by similar ceremonies in the other devalas in the districts. These religious ceremonies connected with the cultivation of fields take the form of thanksgiving to the Buddha and deities whom they respect and venerate. The ancient practice had been for astrologers to fix two Nekath times or auspicious times, one to bring paddy to the respective homes and the other to partake of the meal. During the Kandyan times of the kings freshly harvested Paddy in clean bags and clay pots brought on elephants from Gabadagama and Viharagama to the Sri Dalada Maligawa. Paddy was brought to devalas and the royal palace in specially prepared clean bags which were known asghoni. When paddy was brought to the Aluth Sahal Mangalya, the Adikarams and Chiefs received the party and escorted them to the Mahamaluwa where they waited till the nekath time was announced by the firing of a gun. King Veera Parakarama Narandrasinha of Kundasale fame gifted his stretch of Gurudeniya fields to the Sri Delada Maligawa for the performance of the Aluth Sahal Mangalya. Thus began the practice of bringing paddy from Gurudeniya which is continued to this day. This gift of fields covers 18 annual equivalent to 30 acres in sowing extent. According to the ancient practice, there were two Nekath times one to bring rice from Gunadeniya, and the other to prepare aims from the new rice for the Buddha Pooja. There was a barn erected at Gurudeniya to store paddy collected from the fields. 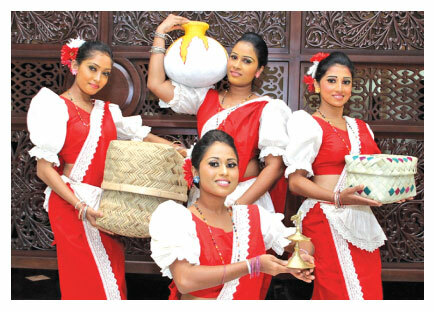 The paddy was brought in a perahara and before it commenced, the party from Kandy was received by Gurudeniya Vidane and seven garnaralas. They welcomed the visitors, the Diyawadana Nilame and Basnayake Nilames of the four devalas by offering them with a sheaf of betel leaves. Having received them, the Vidane and Gamaralas offered them meals before leaving for Kandy. Hewisi and reciting the virtues of the Buddha were made by the dancers as the prelude to the setting out. Kapuralas of the devales recite their sthothra (devotional stanzas). In the distribution of rice, the Sri Dalada Maligawa, the four devalas in Kandy; Asgiriya and Malwatta Viharas and two Maha Viharas mentioned in Nampotha received their shares. And additional share was offered to the Gunagarama Viharaya. The Lekam Mohottala of the Sri Dalada Maligawa read out from the Lekam-Mitiya or register, the names of Viharas and devalas to which rice should be distributed. When the names were read out, the first recipient being the Diyawadana Nilame, takes a silver neliya with him and receives a neliya full of rice as a token allotted to the Sri Dalada Maligawa. The rest of the rice was measured by Minanna. The participants of the perahara of the Sri Dalada Maligawa and four devalas spend the night at Gangarama Vihara while the others disperse on the same day to their viharas and devalas taking rice with them. On the following day, the Aluth Sahal Mangalya perhara takes the new rice and leaves it at Sri Dalada Maligawa till Duruthu Pasalosvaka Poya. On the poya80 measures of rice is boiled and it is filled in the bowl known as Kiribodapatra and make the offering to Sri Dalada. It is believed that the offering accrues great merit to each one who takes part in filling the bowl and in the Buddha Pooja. This offering of rice as a religious ceremony has been continued throughout. Anyone who attempted to cancel or tried to disrupt it would undergo hardships was mentioned in an inscription, In the Third Century, when the Sri Dalada was brought to Sri Lanka and placed at Isurumuniya Vihara also known earlier as the Issarasamanaka where offerings and religious ceremonies were held to Vessavalahaka deity which can be considered as the beginning of Buddhist ceremonies in Sri Lanka.